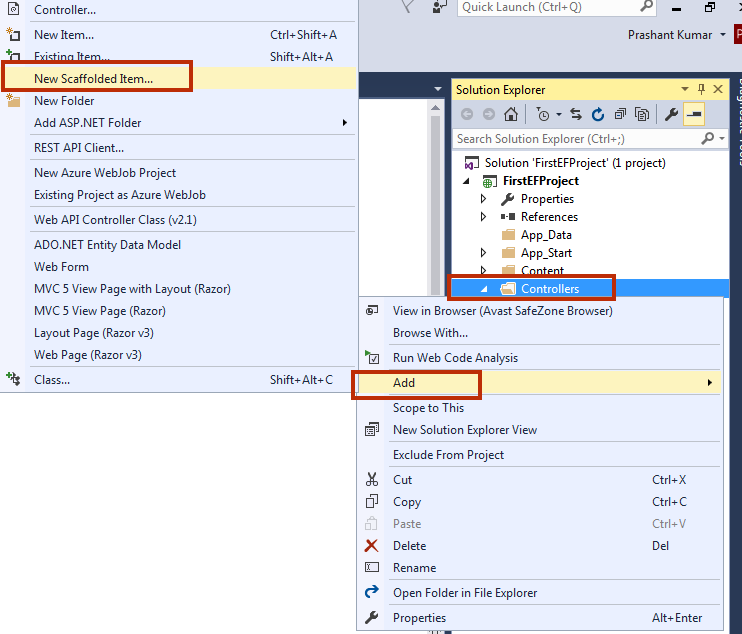 In this tutorial, I will show you how to start with Entity Framework – Code First approach. I have added all the steps in order to minimize complexion and keep it easy. Don’t worry, once you learn how to use EF Code First Model, later you will know everything about it. Just focus on your first EF Code First project. Start a New MVC Project and Give Project Name EF_CodeFirstModel. 1 Open Visual Studio. Go to File > New > Project. 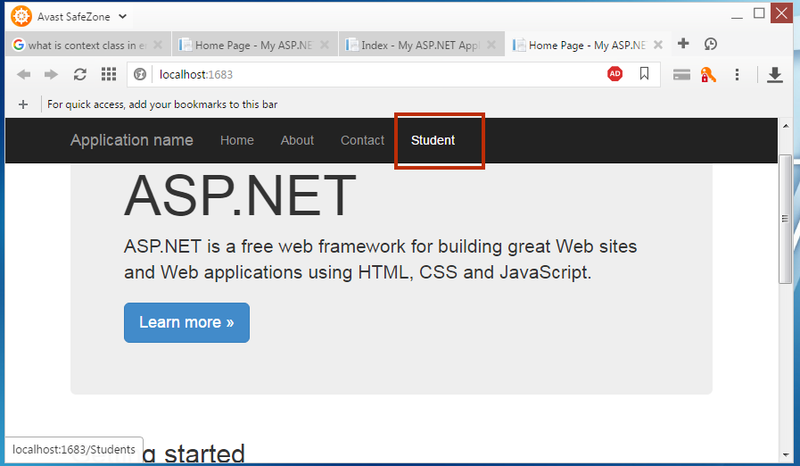 2 Select Web in the left panel and then select ASP.NET Web Application (.NET Framework) from middle panel. 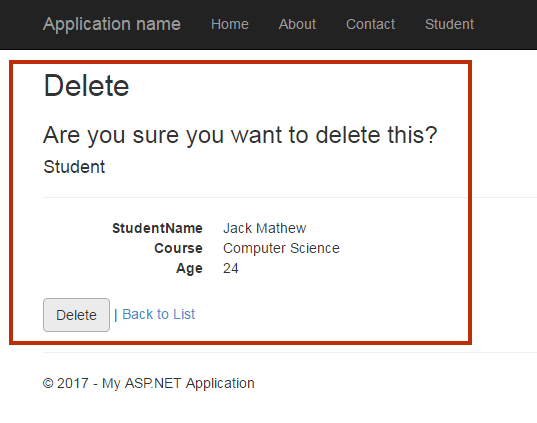 Give Project Name EF_CodeFirstModel and click OK.
3 Select MVC in template window and change authentication to No Authentication and click OK. 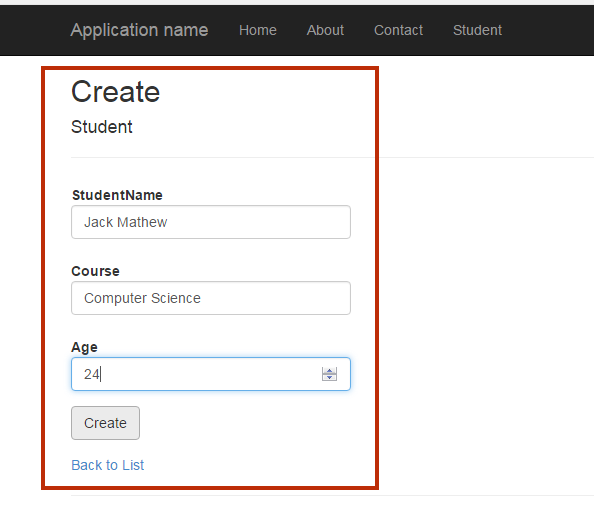 If you still don’t know how to create a new MVC 5 Project then go to this short tutorial. Next step is Install Entity Framework. It is very easy. Right click on your project EF_CodeFirstModel in solution explorer and click on Manage NuGet Packages. Browse for Entity Framework and click on Install button to install it. Here, is a detailed guide to installing Entity Framework into your project. Now we will create a model class. This model class will be converted into database and table. Here, I am going to create a model that will store and manage data from student table. Add following code into Student.cs model class. Note: Entity Framework automatically assign primary key to the value which contains ID suffix or prefix. This model class will automatically create table with 4 columns. Context class is a very important part of Entity Framework. In a simple word, context class makes a bridge between your application and database. This context class is also responsible for managing data into a table like insert, update, delete and search. 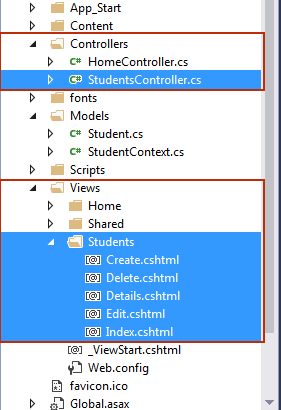 Add a new class in Model Folder and give the name as StudentContext.cs. 1. The class StudentContext Inherit the DBContext class features. 2. Pass Database name in a constructor. This name will be used when EntityFramework will create a database for you. If you don’t provide database name then EF will automatically create a database using the name of your project name. 3. Created object Students for DbSet<Student>. This object will be used as a bridge between your application and DbSet<Student>. Press Ctrl + Shift + B to build your application. Building your project makes all the class connect together with Entity Framework. Adding Scaffolded Item into controller means, this item will automatically create controller and views according to your Model class. Right Click on Controller > Add > New Scaffolded Item. 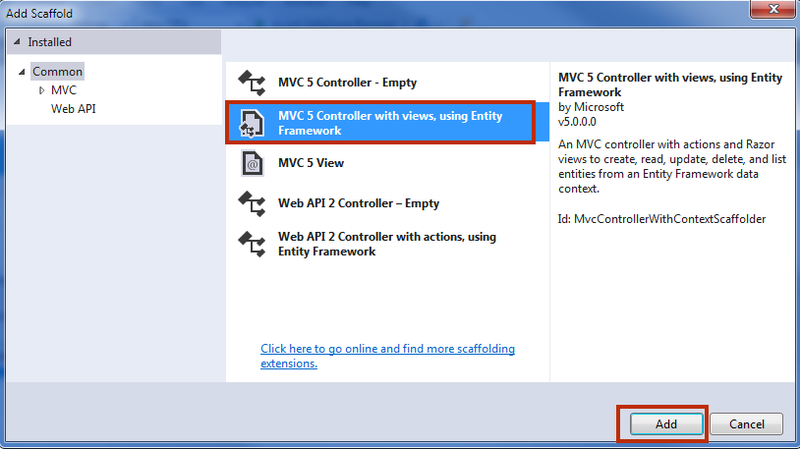 Select MVC5 Controller with views, using Entity Framework and click Add button. 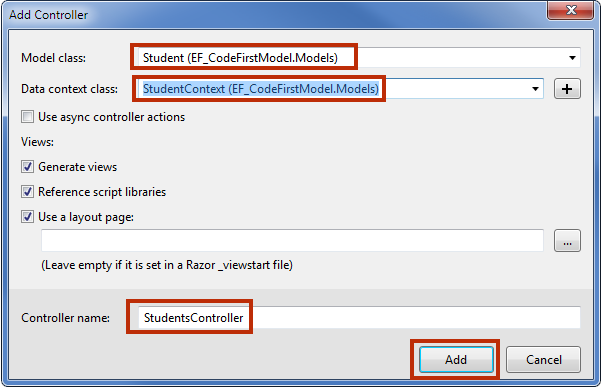 Select Student (EF_CodeFirstModel.Models) as Model class name and StudentContext (EF_CodeFirstModel.Models) as Data context class name. 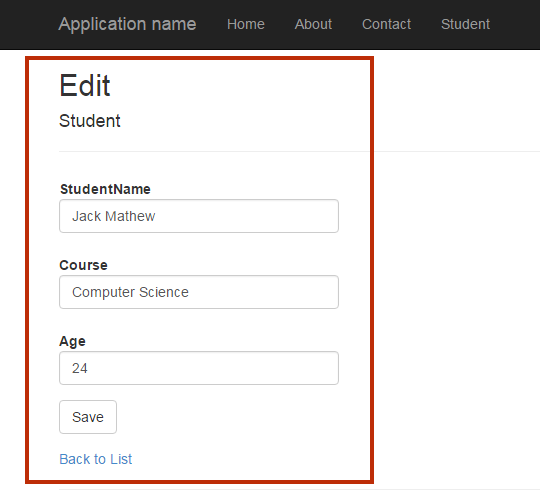 Give Controller name StudentController and click Add. Note: If you got an error, it means you haven’t build your project. Click on Ctrl + Shift + B to build your project. A StudentsController.cs is automatically added in Controllers folder. Inside View Folder, Students Views are automatically created with the following page. This is the final step. Your project is ready to be launched but before launching it insert a navigation link on the Home Page. Open Views > Shared > _Layout.cshtml. 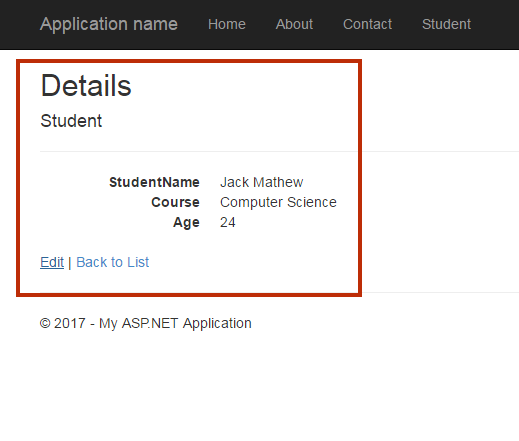 Add a link for Students controller. Congratulations! Your project is ready to run. You might be a wonder when you see the output. However, we will discuss all the point later but now run your project by pressing F5. In this tutorial, you learned Entity Framework Code First approach. However, it is very basic chapter but I hope you learned how to use Code First Model. Now, there are following questions are there which must be running on your mind. Where the database is created by EF and how to use your own connection string? What if you need to add an extra column to a table or change table definition? How to determine column datatypes and size, foreign key and primary key in EF Code First? How to put validation on table column and View Page using Model Class? How to work with multiple tables in Entity Framework? In the next chapter, you will learn EF Code First (Existing Database) Approach with Example.